It has been over a year since Hurricane Maria first made landfall on Puerto Rico. As the island slowly rebuilds, first responders, healthcare providers and scientists on the island have been left to deal with the emotional toll on their communities and their own families as members of the "Maria Generation." Though 64 people died as a direct result of the storm, an estimated 2,975 died as a result of its aftermath, according to Puerto Rico's most recent official counts based on a study published in August of 2018, conducted by George Washington University and the University of Puerto Rico. There has been disagreement about the exact death toll. For example, President Donald Trump tweeted in September of last year that it was as low as six to 18 people. Regardless, the Federal Emergency Management Agency (FEMA) reported that 100 percent of the Puerto Rican population was affected by the storm in some way. As a result of the storm, children on the island were particularly hard-hit, missing an average of 78 days of school, some with no school to return to, and one in four have suffered anxiety, according to a recent report from Instituto Desarrollo Juventud, a group that seeks to advance public policies for the welfare of children. Such "adverse childhood experiences (ACEs) [are] especially detrimental for children, with long-term negative effects on learning, behavior and health," Victoria Brown, senior program officer at the Robert Wood Johnson Foundation(RWJF), the largest public health philanthropy in the U.S., told ABC News. Of the estimated 175 million children impacted by natural disasters every year in the last decade, those who survive ACEs, like parental separation, may be at an increased risk of chronic disease and premature death later in life, according to the Centers for Disease Control and Prevention. "For three weeks I thought my kid was dead," Alexia Suarez, psychological program manager for Americares Puerto Rico Mental Health Services, told ABC News. "And that is devastating." She added that healing is "an ongoing process because he developed a lot of mistrust." Children are not alone in coping with ongoing mental health effects. Nerdys Nives, an employee of the Department of Human Resources at Ryder Hospital, told ABC news that 35 hospital employees lost their homes, and three lost family members to the storm. Her hospital is in the town of Humacao, near where the hurricane first hit the island. Nives' home was destroyed. "I had depression and would cry every time I thought of what I lost in the hurricane," she said. 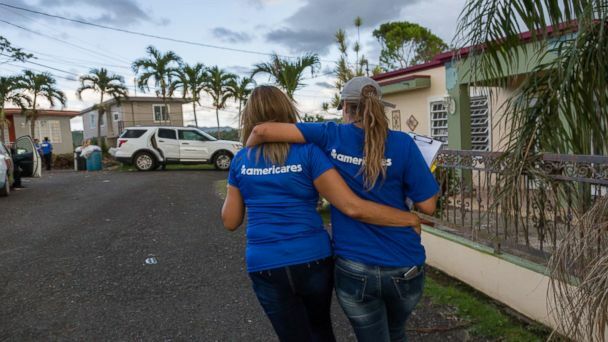 Though programs like Americares have an important mission, some have voiced concerns over their staying power, and whether their approaches are evidence-based. "What I am most worried about is the long-term sustainability of these programs," Martinez warned. Nives, however, said that the program aims for longevity. "After [employees] receive the training, they can go out to loved ones and people they know that are also going through these difficult situations and spread that help to get better and learn how to cope," explained Nives. Americares evaluates all participants before and after involvement with the program to measure its benefits, with NIH funding to analyze and improve program outcomes, according to Suarez. Despite the challenges of community-based programs like Americares, Nives says she wishes everyone had such an opportunity. "Americares was the blessing that came to this hospital to help lift us up!" Dr. Robin Ortiz is an internist and pediatrician and a member of the ABC News Medical Unit.